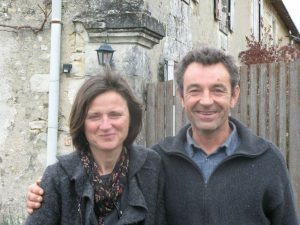 Francois and Pascaline Plouzeau maintain an immaculate vineyard near the fascinating village of Richelieu which lies south of Tours quite close to the Chinon region. Here they implement strict biodynamic vineyard practices which are certified by Ecocert. A feature of their lovely wines is the wonderful set of labels produced by local artists that reflect the naming of the wine. So the racy Cendrillon white, as the name suggests, has a Cinderella theme. Tasmanians will note a Samek-like whimsy in some of the paintings.Their wines have been very well-received in the United States with the Washington Post raving about the straight Sauvignon Blanc and Parker rating the Cendrillon highly in edition 172 of the Wine Advocate. It is wonderful to have this lovely wine in Australia again! The name comes from the fictional poor girl who became a princess. When we were doing the research about this wine and the origins of the name, we were surprised to find that the story has been around since ancient Greek times with a similar story written by Strabo in 7BC. It was not until 1697, that the french author Charles Perrault wrote the version that included the pumpkin and the glass slippers (which you can see on the label). 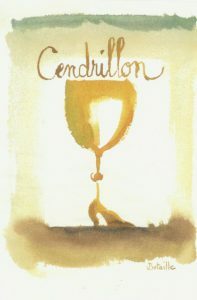 His version was called Cendrillon, the French name for Cinderella. This wine is made from the best Sauvignon Blanc grapes from the biodynamic vineyards that surround the cellar on the hill outside the village of Richelieu. It is made from 100% Sauvignon Blanc. Just 30% of the Sauvignon Blanc spent some time in old oak barrels to provide additional complexity. This is a fascinating wine for us. The first couple of sips mark it as an interesting wine but, gradually, it opens up in the glass to reveal citrus notes and a fine line of minerality as well as a complexity that belies its price. This was one of the wines that first made us sit up and take notice of the natural wine movement that was sweeping through the Loire and Beaujolais and on into the rest of France. 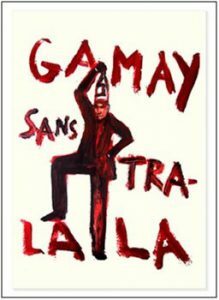 It is made from 100% Gamay and is fermented naturally without the ‘help’ of commercial yeasts. It is fresh, lively, full of flavour and, above all, delicious. Good for drinking anytime, anywhere. The joyous label captures the essence of this wine. The French would call this a ‘gouleyant’ wine, meaning that it is gluggable or smashable. The 2017 cuvee is particularly good. It is fresh, it is low in alcohol, it is expressive of the Gamay grape and it is gluggable. This entry-level wine from the Touraine appellation is made from 100% Sauvignon Blanc. This grape variety is very popular at the eastern end of the Loire running from Sancerre through to Touraine where it thrive on the rolling plains below the interesting city of Tours. The Sauvignon Blanc provides the characteristic aromas and taste profiles that you expect from wines made from this grape in the Loire Valley, however the vines have been treated biodynamically therefore the vines and the grapes are healthier. This vintage is particularly delicious with clean, fresh, vibrant flavours and a long finish. We think that the Le Blanc represents excellent value for money – and it is biodynamic and fermented naturally thus providing additional complexity. 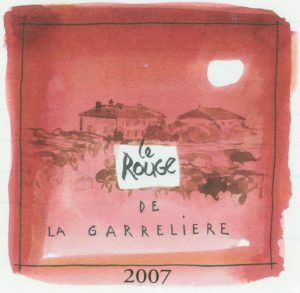 This year we have ordered some of the rosé from Garreliere because, when we tasted it in February at the Montpellier trade show it was just so lively and interesting. 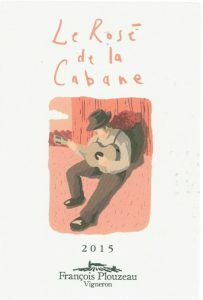 In 2015 the wine is made from 50% Gamay and 50% Cabernet Franc. The Cabernet Franc was directly pressed whereas the Gamay was the result of the saignée process. Saignée is a process whereby the grapes are pressed and then left with their skins as if to make a red wine. Usually with red wine production the juice is left with the skins for a period ranging from just a few days up to a few weeks. To make a saignée rosé, some of the juice is taken out of the tank after a couple of days of skin contact and then the rest of the juice remains to make a red wine. In the case of the Gamay the juice was taken out of a stainless steel tank. This is a bright, fresh, fruity and deeply-flavoured light pink rosé that is perfect as an aperitif. Only a tiny amount of sulphite was added at bottling. This entry-level wine from the Touraine appellation is made from 100% Cabernet Franc. The Touraine Le Rouge des Cornus from Pascale and Francois Plouzeau is a biodynamic wine that shows why people in the Loire drink Cabernet Franc. 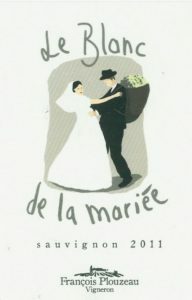 The wine is smooth and elegant, has a beautiful perfume and is very low in sulphur. We are very happy with this vintage. It represents exceptional value for money. This lovely wine from the Touraine appellation is made from 100% Chenin Blanc, a grape which reaches its highest expression in the Loire Valley. On the Plouzeau estate, the clay and limestone soils seem to coax even more flavour from the 20 year old vines of Chenin to produce elegant wines with great flavour. The slopes on which the vines thrive face south west. We think that the Le Chenin represents excellent value for money – and it is biodynamic and is made naturally. 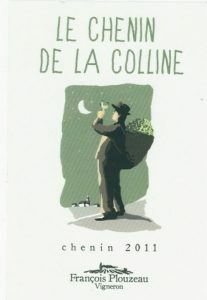 It is rare to be able to access a well-made Chenin Blanc from the Loire made with such dedication for a price like this! We also like the new label with its gentle nod to the biodynamic winemaking approach that Francois is so passionate about. The label depicts a winemaker saluting the moon which has so much influence on the vineyard. The Marquis de C is a beautiful wine made from 100% Chardonnay grapes, which is rare in the Touraine region of the Loire Valley with Sauvignon Blanc and Chenin Blanc being more common. The grapes were pressed and the juice transferred to 500 litre wooden fûts for fermentation and maturation on lees for 12 months without any battonage. The grapes were hand harvested from thirty year old vines in early October with a yield around a very low 25 hectolitres per hectare. The vineyard soils are flint and flint clays sitting over limestone. The name for this wine comes from one of the works of the prolific 17th Century French author Charles Perrault who either adapted or was the originator of many fairy tales including Cinderella, Little Red Riding Hood and Puss in Boots. 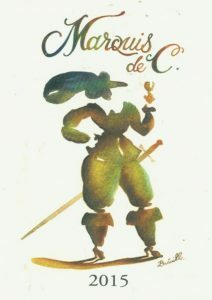 It is from Puss in Boots that the character Marquis de Carabas is to be found and this fictional character is from where the name for this wine is derived. We still have a few bottles of the 2013 vintage of this wine which was based on Chenin Blanc rather than Chardonnay. This flavoursome red is made from a small plot of biodynamically-tended Cabernet Franc vines that are more than 25 years old. The wine is smooth and elegant and weighs in at 12.5% alcohol. Only minimal sulphur has been used. This pétillant naturel is a blend of Cabernet Franc and Chenin Blanc made as a pet-nat (but a complex one). 80% is the juice is from grapes from 2016 (50% of each variety) which were fermented in a tank then cooled a little to slow the fermentation. It was then blended with the last 20%, a reserve wine from the previous vintage. It was bottled between 18-20 g/l of residual sugar where it kept fermenting to produce the bubbles. It was aged for a year and riddled by hand for a month then disgorged. It has no added sulphites. 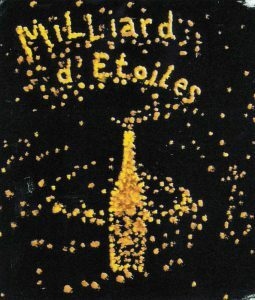 The names translates as a “billion stars”.